The trend toward using fewer chemicals for crop production also pertains to managing plant height. A common problem for growers during the spring season is overgrown plants. Some growers lower the night temperatures to save on energy costs, while the daytime temperatures soar during bright sunny days result in plant stretch. The greater the difference between day and night greenhouse temperatures, the greater the plant stretch. Spring crops may also become too tall if they are started too soon or are grown in low light levels. Fast-growing herbs such as basil, chives, and dill and vegetable plants easily become overgrown if started too early. Low light levels can result from plants being spaced too close together, hanging baskets shading plants below or greenhouse glazing being old and dirty. Old, dirty greenhouse film in combination with lack of daytime ventilation commonly causes plant stretch. Depending on the extent of these factors, growers can sometimes use cultural practices and plant growth regulators to salvage plants by slowing down stretch. The DIF technique of temperature control was developed at Michigan State University during the 1980's. Research showed that the difference (DIF) between day temperature (DT) and night temperature (NT) could be used to control stem stretch in many plant species. Stem elongation is promoted by warmer days than nights (+ DIF) and inhibited by warmer nights than days (- DIF). Plants become taller when DIF becomes more positive and plants stay shorter as DIF becomes smaller or more negative. A different, but easier approach to using DIF with similar results is to reduce the greenhouse temperature 5-10° F lower than the night temperature for 2- 3 hours at dawn. Called a "cool morning pulse", this approach reduces plant height as much as a negative DIF. DIF has its greatest effect on height during the period of most rapid stem elongation. DIF does not have to be applied continuously throughout a crop cycle to be effective, but rather only during the period of most active vegetative growth. Temperature also affects the rate of plant development to flowering or marketing time. Growth rate is a function of the average daily temperature (ADT). When using DIF, the ADT should also be calculated and used with DIF. As ADT increases the rate of plant development will increase and as ADT decreases the rate of plant growth will decrease. The average daily temperature (ADT) can be calculated by adding the night temperature times the length of the night period (in hours) to the day temperature times the length of the day period (in hours), and then divide this total by 24 (the number of hours in the day). A DIF treatment raising the average daily temperature would speed crop development, while a treatment lowering the average daily temperature would slow crop development. DIF, like a PGR, has its greatest effect on height during the period of most rapid stem elongation. DIF does not have to be applied continuously throughout a crop cycle to be effective, but rather only during the period of most active vegetative growth. Response of some plants to DIF. A note of caution: DIF treatments affect the rate of crop development as well as stem elongation. Growers using DIF should determine the effect of their DIF treatment on the average daily temperature. A DIF treatment raising the average daily temperature would speed crop development, while a treatment lowering the average daily temperature would slow crop development. One of the easiest ways to reduce height is to maximize the amount of light plants receive to reduce "stretch." Providing adequate spacing, reducing the number of overhead planters and new or clean glazing will all help to prevent overgrown plants. Note that dirty glazing can reduce light by 20%! Reducing fertilizer or water are other methods used to prevent stretch. Some growers try to hold back plants using low temperature in combination with nutrient and/or water stress. Low fertility or mild water stress can be successful if carefully controlled. However, there are risks - such as the development of nutrient deficiency symptoms which are difficult to correct, or plant damage due to water stress. The nutrients which have the most effect on the size of greenhouse plants are nitrogen (N) and phosphorus (P). Limiting nutrition and water will not likely help plants that are already overgrown. PGRs are useful tools for slowing down plant growth, but should be used wisely on spring crops and not as substitutes for good cultural practices. PGRs are treated as pesticides and have re-entry intervals. There are no PGRs labeled for use on herbs, however, the PGR Sumagic (uniconazole) is labeled for use as a foliar spray on several vegetable transplants (eggplant, ground cherry, pepino, pepper, tomatillo and tomato) grown in greenhouses. How does a grower handle growth when different species are mixed in the same container and (1) plants in the same container have widely different vigor and require different PGR control and (2) the growth regulation objectives vary for plants in the same container. 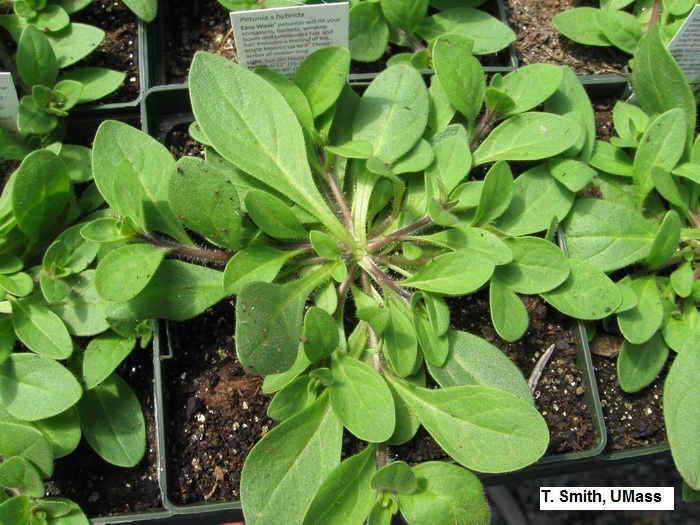 For example a grower may have a dwarf angelonia that requires no PGR control in the center of a container surrounded by an extremely vigorous petunia cultivar that requires aggressive PGR control. In another situation, a grower may want to increase branching on an ornamental millet plant in the center of the mixed container but also control vigor of sweet potato vines planted along the margins. In both of these situations a grower cannot apply a single PGR treatment to the mixed container and achieve the desired result. The solution requires that the grower treat individual plants in the mixed container without affecting the others in the same planting. 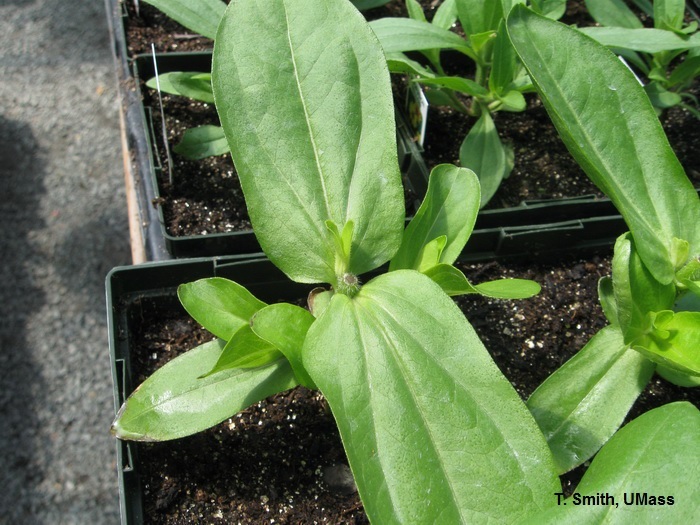 To control growth of the most vigorous varieties or species without affecting the less vigorous plants, the best option is to pre-treat the transplants as needed. A "plug dip" is a useful technique for this purpose. Here the plug flat is set in a tray of PGR solution and the rooting medium of the plugs is allowed to soak up the growth regulator. Allow the plug flat to sit in the solution for at least 5 minutes, some growers will allow 30 minutes but the plug root volume should reach saturation before that much time. After soaking allow the plug sheet to sit on the bench overnight before transplanting into the final container. Only root-active PGRs such as A-Rest, Topflor, Bonzi and Sumagic (and their generic equivalents) can be used for this purpose. These chemicals can remain active in the root zone for months, and they tend not to migrate far from the treated soil. Therefore, control is conveyed to just the individually treated plugs and not the other plants in the mixed containers. For rates, use Bonzi at between 4-16 ppm, use Sumagic at 2-8 ppm, for Topflor use 3-12 ppm. If you have not tried this before, start with rates in the lower half of the recommended range. With groups of plants that have different growth regulator requirements such as increased branching associated with Florel versus height control associated with growth retardants, the option again is to treat the plants separately. Here you can go two ways. Transplant the plants that require Florel into the final container & spray, and then fill in with plugs of the vigorous species that have already been treated with a root-active PGR as previously described. Alternatively, the container can be planted with the treated plugs, leaving a space for the Florel requiring plants. Grow the plants that require Florel in small containers (e.g. 4-6"pot) until the treatment schedule is complete and then drop them into the empty space. Growers will often plant an empty pot to facility the late transplant with minimal disruption to the other plants growing the mixed container. PGRs can also be used to hold plants in check once they reach their final size. This is helpful when weather conditions dictate that plants be held longer than anticipated. In these situations, a spray or drench application of one of the root-active compounds (A-Rest, Bonzi, Sumagic, Topflor) can work but sprays are preferred since high concentrations are required to hold the plants at this stage and sprays work faster but have a shorter residual effect. Therefore, high concentration sprays are less likely to reduce garden performance than high concentration drenches. Growers should take precautions to prevent an overdose, which can have a long residual effect and as a result, plants may not perform in the garden for the consumer. For a proper hold, growers should consider selecting a concentration in the upper half of the normal recommended range for that crop or even 50% higher than the rate recommended for slowing growth during the grow-out stage. For example, the normal spray rate for A-Rest on Ageratum in flats during grow-out is 10-15ppm, but a rate of 15-26ppm is recommended to hold this crop. The same principle would apply for the other PGR compounds. Note that Cycocel is not recommended for this purpose since the spray rates required would be so high that phytotoxic injury would likely occur. Plants can also be treated before being transplanted into larger containers or combination planters to hold them. Growers without experience using PGRs to hold plants can start with the high end of the normal recommended rate to put a hold on growth. A second treatment can be applied if the first is not enough. A proper hold rate should give enough control to hold a mature plant under hot weather for 2-3 weeks but low enough that the plant will recover and grow for the consumer. Spray treatments carry less of a risk of overdose than drench treatment, especially when the root-active PGRs are used. When using a PGR for the first time, treat a small group of plants and keep accurate records of the response and conditions in the house. And finally, when all else fails, some growers simply cut back the growth. Cutting back is the process of removing one-half or more of the plant to reduce the size of overgrown plants. Some plant species respond well to being cut back by producing abundant new growth, but others do not. Growers should be aware that pinching some overgrown plants can result in poor branching from hard woody stems below. If the response to cutting back a particular species is unknown, cut back a few containers to test the species' ability to recover. Cutting back should be reserved as a last measure to reclaim plant quality. Perhaps the plants are just slightly overgrown, or need some shaping, by using a soft pinch or hard pinch. Pinching is the process of removing soft growth from a plant to overcome its natural tendency to branch. This tendency, called apical dominance, results from the production of auxin, a natural plant hormone, by the terminal growing point and young leaves. Removing the terminal growing point and one or two uppermost leaves, is a soft pinch. A soft pinch removes the source of auxin and allows dormant buds below the pinch to grow. A soft pinch is done by pinching off the stem using your thumb and forefinger, or by cutting off the growth mechanically, using a knife, scissors, or clippers. 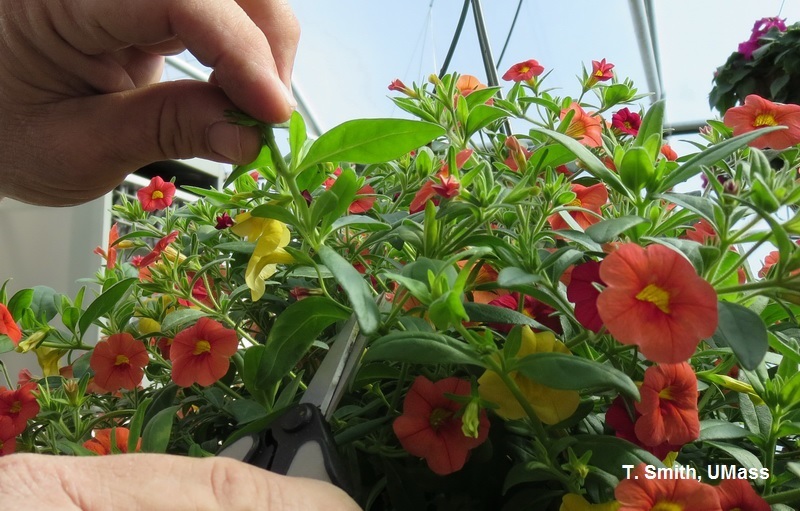 Many growers make one or more soft pinches to plants in hanging baskets to control their overall size and shape, to increase flower number, and to create full, thick growth. When plants are overgrown, beyond using a soft pinch, growers may remove the terminal growing point and two to four leaves. This is considered a hard pinch and delays flowering more than a soft pinch. It may also result in less-than-desired branching from the original plant if not enough nodes are left behind. Plants can be pruned and shaped at any time to reduce stretch and improve aesthetics, however, flowering or re-flowering will be delayed by two or more weeks and pinching is labor intensive. Some growers will make subsequent pinches at 3- to 6-week intervals, depending on the plant species, and growing conditions. Additional pinches result in fuller growth and add to quality but also add significantly to total crop production time. Unfortunately, tasks often do not get performed on time during the peak production season, and as a result, overgrown plants need to be rescued.